Matthew leads the execution of Trinity Capital Advisors’ investment activities. His responsibilities include acquisitions, structuring, business plan implementation, and oversight of Trinity Capital’s underwriting and due diligence processes. 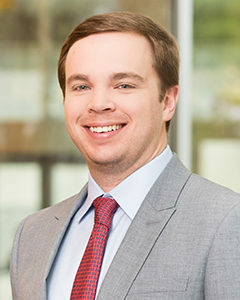 Prior to joining Trinity Capital Advisors, the Charlotte native was an associate in the US Real Estate group with Goldman Sachs in Dallas, Texas, where he was responsible for all aspects of new acquisition activity and asset management of an existing portfolio, focusing on office and industrial assets throughout the United States. During this time, Matthew held oversight responsibilities for a 2 million SF office portfolio and closed on $720 million in acquisitions. Previously, he also served Goldman Sachs as an analyst and was responsible for analysis of investment opportunities and execution of asset management objectives. Matthew was involved in acquisitions of more than $1 billion, asset management of a portfolio with more than 7 million SF, and dispositions of $300 million with a focus on office and industrial product types. Matthew is a Wofford College graduate and works with Reclaim Childhood, a charitable organization working to empower refugee and at-risk women and girls in the Middle East through sport and play.